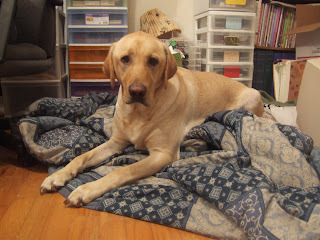 Today is Buddy (my dog's) birthday! For his birthday he got a big bone. Happy Birthday to my precious Buddy! He is 2 in human years and 14 in doggie years! Today I received my Stampin Up Sale-A-Bration Stamps from my Upline Vivian. 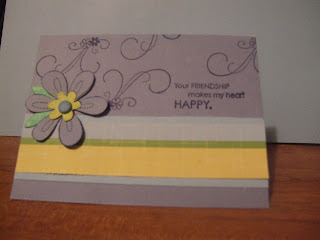 The stamps are from the Friendship Blooms stamp set. 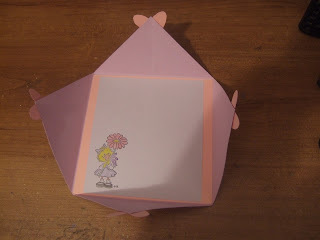 The inks, pattern paper, and brad in the center of the flower are not stampin up products. I really like this stamp set, there are many uses for it so be on the watch for many more cards using this set. I received the "You Cheer Me Up" award from Dawn. Dawn is an amazing person! She always makes me smile with her kind words and her wonderful blog! If you haven't checked out Dawn's blog please me sure to do so. I would like to pass this on to of course I would like to send it to Dawn because she truely does always cheers me up but she already received the award. So I will pass it onto Michelle and Amy. Its that time again in the week for Sunday Scrappin where you post your Ta Da's (goals your completed throughout the week) and your To Do's (goals you want to accomplish in the upcoming week). 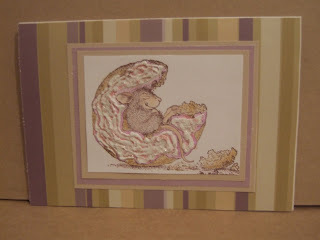 Another Ta Da that I am very excited about this past week I became a Stampin Up Demo! I am so excite! If you are interested in buying Stampin UP products or would like a catalog please email me mickey8888@verizon.net. If you would like to place an order and you do not live near me that is fine contact me and we can work at a deal on the shipping and your order. This week's bonus question is: What's your favorite supply to work with right now? When I first read this week's question my first response was oh my only one?! Hmmm.... I would have to say right now I am in love with Snow Writer. I love that stuff! It can be used to make snow on pages or as frosting on a card. LOL! Hope everyone has a Happy Scrappin week! 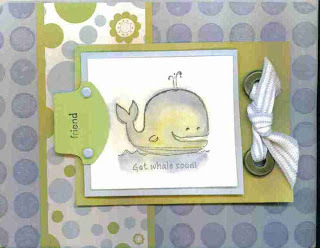 I received a Get Whale Card from Vivian my Stampin Up Upline - Thats right I am joining SU has a demo. Not sure how it is going to work out, fingers crossed that it works out and goes good for me. (I am not a demo yet, I hope to do the paperwork for being a demo this weekend). All of the items on Vivian's adorable little card are from Stampin Up. If your interested in any of the products on the card or any other SU products please contact me (mickey8888@verizon.net). Thank you so much for the wonderful card Vivian, it helped to brighten my day and it made me smile! Today I received a wonderful surprise in the mail from Michelle it was a pretty get well card. Thank you so much Michelle! I am delighted to say that on Michelle's card she wrote "You Lucky girl, you are the first to get a Stampin Up Card from Me". So the question is do I keep the card like the good pack rat I am or do I try to to make the big bucks and auction it on ebay being that it is not only a one of a kind handmade card but it is the First Michelle SU that was given out. What do you think I should do keep it or ebay it? LOL! First I have to admit I love the saying To Infinity......And Beyond! But then again that's the disney fan in me. Second this is on okay layout, I don't hate but don't love it neither! For the title I made the arrows using the cricut george cartridge. I took a rectangle and a triangle taped them together to get the arrow look and then traced it onto my cardstock. I made the arrows pointing 2 different directions because while making this layout in my head I invision Buzz Lightyear spinning all around all over so the areas to me represent him flying that way then this way. I know like Jeff would say I'm a dork. The words To Infinity and Beyond and the rockets, planet on the arrow, and the large Buzz in the left hand corner are all Jolee stickers. We didn't take many pictures on "Buzz Lightyear's Space Ranger Spin ride in Disney because we were more busy playing and enjoying then thinking like a scraper (But hey they say go on vacation and enjoy don't take pictures thinking like a scrapbooker). And we didn't get the ride photo that they take of you because the photo was of the back of our heads. 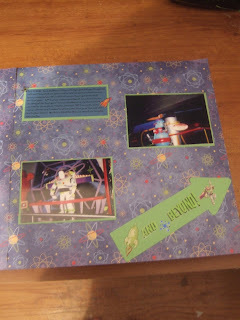 Journaling Reads --- Feb. 9, 2006 - Buzz Lightyear's Space Ranger Spin (Magic Kingdom) Jeff and I boarded our space cruiser and we were ready to become space commanders. We each had our own laser gun to shoot of the "bad guys". Jeff had our cruiser spinning all around and he was shoogins so many bad guys there weren't any for left for me to shoot. I kindly reminded Jeff I was in the same cruiser with him and I wanted to shoot some "bad guys' too and whti that he then shared. We had a lot of fun, this was one of our favorite rides by far. It was funny because even when Jeff finally did share with me he still had to shoot a majority of them because I kept missing. LOL! The journaling was done on the computer using Space Ranger Font that I downloaded for free from the web. Pattern paper is by Paper Pizazz Blue Atoms. I sub to Gina K Designs Blog and today she had a post about a contest that was going on at Stampinmama's Blog. So I wondered over to her blog and she has an awsome contest full of wonderful prizes she's giving away in honor of her son's birthday who has autism. I personally do not know anyone with autism but I am aware of it. This is a wonderful thing she is doing in honor of her son. And the contest to open to EVERYONE regardless of where you live! So go enter the contest and learn about autism and how you can help at the same time! 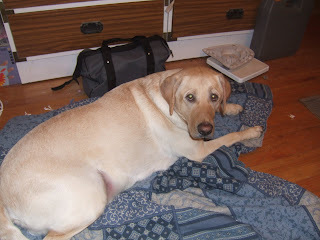 (let her know I sent you - I am no way affilated with Stampinmama nor do I know her, I came across her blog today). 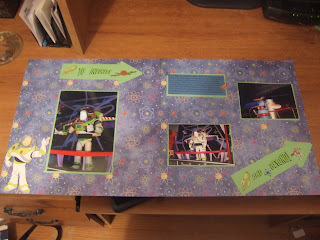 Be sure to check back here tomorrow (Monday) for another Disney Scrapbook page that I made today (sorry can't upload tonight camera batteries are charging). 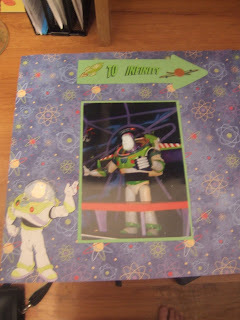 I'll give you a hint what the theme is "To Infinity And Beyond"! DISCLOSURE: EVEN THOUGH TITLE STATES "SO YUMMY I COULD EAT" THIS CARD IS NOT EDIBLE. PRODUCTS USED ARE HIGHLY TOXIC AND POISONIOUS IF EATTEN! I wanted to try something new and different, at first I wasn't sure how it was going to turned out but I like it. I received Snow Writer for my birthday, I have used it on my layouts of Buddy's (my dog) SnowPages and liked the effect it had of snow. I have a house mouse stamp "Donut Bliss" that I wanted to try the Snow Writer on to make it look like frosting. So I colored the image in with colored pencils (including the frosting part of the donut). Then I took the snowwriter and put it over just the frosting area of the donut, once that dried(the stuff dries fairly quickly if you don't use a lot of it) I took an old paint brush and smeared cotton candy stickles over the snowwriter. I didn't have to use much snowwriter or stickles to get the look I was going for. The picture is hard to tell but if you click on it to enlarge it you may (hopefully be able to see it better) . The striped paper and Purple paper (are one in the same front and back) is from Scrapbook Walls Parlor Stripes by Chatter Box. It is Sunday Scrappin time again. It's the time where you post your Ta Da's for the previous week (things your excited about that you made) and your goals for the upcoming week. This week I only completed one of my goals. I have been battling with a horrible stomache bug all week. I still don't feel 100% but I'm doing a little better then I was yesterday. This bug that is going around is horrible. If you come in contact with anyone that has it RUN and RUN fast. I'm serious, you don't want it. 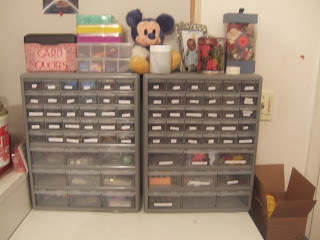 You can see the below post or click Minnie's Mouse layout to see my Ta DA for the week. I started this layout last week and I was determined sick or not that baby was getting done today and its done. LOL! 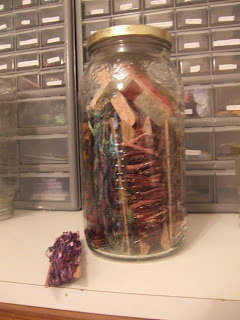 This weeks bonus question is What are your best organizing tips for storing your craft supplies? 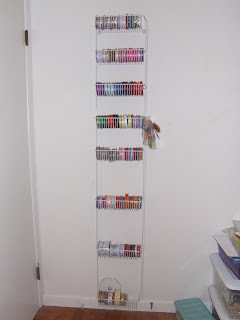 This blog won't let me add another picture but I store my hand punches in a over the door shoe rack holder. 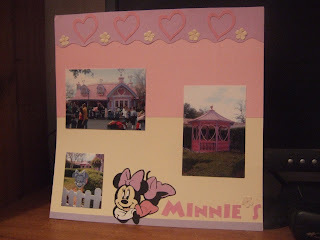 I made the scallop edge border across the top to make it look similar to the roof on Minnie's House. 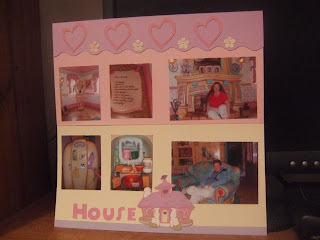 The hearts are from Sizzix Heart Double Die (these hearts are similar to the hearts on Minnie's House). I put a spot of cotton candy stickles in the center of the flowers. The title was done on my computer using the Minnie Mouse Font printed onto cardstock then cut out. The minnie mouse and house are from the Cricut Mickey & Friends Cartridge. On the page on the right, I love the picture of Minnie's Things To Do TOday List. The list reads: 1.Call Mickey 2. Mouseersize 3. Make a box lunch for Mickey 4. Have a nutritious, low fat breakfast 5. Call Mickey 6. Tend to the Garden 7. Bake a cake for Mickey 8. Go to recycling center 9. Call Mickey ----- I must say after seeing here to do list I had a new found respect for Minnie knowing fast handly she is taking good care of my mickey mouse. 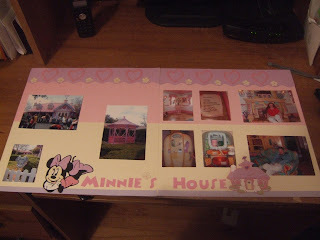 Click More Disney 2006 Scrapbook Pages to see more pages I made! I am still feeling under the weather, this bug that is going around is horrible. I haven't worked on any projects. 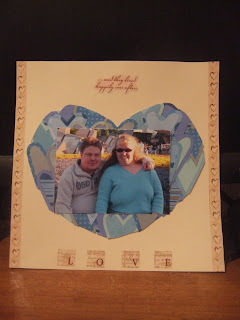 I am glad to finally be able to open load the page and card I made Jeff for Valentines Day. He got a kick out of the card. 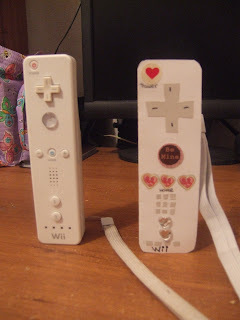 The card resembles the Wii Remote for the game but instead its the Valentine Wii remote with heart buttons instead of circle buttons. LOL! The strap is an actual extra Wii strap that we had. 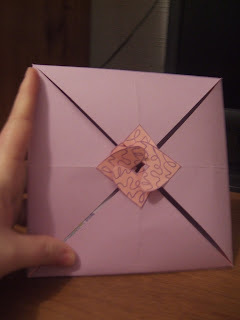 Normally the strap goes on the bottom but I put it on the top so that the card could stand easier. I took a picture of the card next to the Wii remote so you can see how they very similar. The little squares on the card represent the speakers. For the page. OOoohh my! What a heck of a time I had making the heart shape with all the hearts. The easy part was cutting out all the hearts with the Cricut George Cart. The tricky part was getting them in the shape of a heart. I actually at one point got fed up and throw it in the trash. Jeff took it out of the trash and said thats a waste. I grabbed it from him and threw it away again, that went on for a few minutes, he would take it out I would put back in. Then finally he took it out and just started cutting and got into the heart shape you see on the page. I was like Duh why didn't I think of that. LOL! I spent the day on the couch fitting this horrible stomache bug and it looks like tomorrow is going to be another one of those couch days. When I do manage to get up off the couch I quickly check my email and to my surprise I got an award from Dawn. I truely stalk Dawn's blog several times a day always seeing what she is up to. I was actually getting worried about her because she didn't post in awhile but she was on a well deserved vacation. And of course Dawn I LOVE your blog like I said I check your blog as soon I get online, after dinner and before bed (no lie I am addicted). Back to the couch I go. I have a card and a layout that I started and hope to get to this week. Its Sunday Scrappin time once again. All I can say is I hope this week goes better then this past week. Now on to happier scrappin news. This week I worked on some projects but I can't upload them until after Valentines Day. 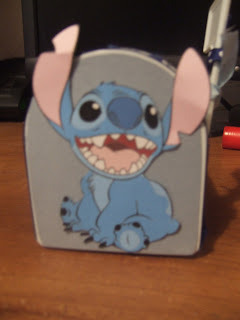 And the Stitch Mailbox I made and gave Jeff for his Birthday. 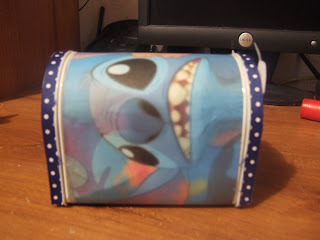 There are do embellishments or paper available yet of Stitch so the Stitichon the front is clipart from the computer and the paper is actual computer wallpaper that I printed out onto cardstock. 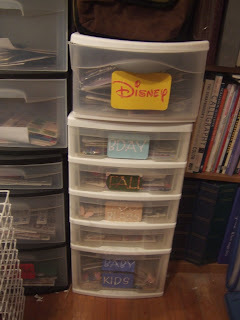 I Love Disney (for free Disney Fonts to download - Love the Cinderella one), Cricut Msg Board. Happy Scrappin, RubberNecker Stamps (haven't placed an order but will be shortly love the designs of their stamps), All That Scraps. I am sure I forget many blogs and many other sites. Happy Birthday to you, Happy Birthday to Jeff! Today is Jeff's birthday so everyone please wish him a Happy Birthday! You may ask why the image of Jasmine, well I have a funny story to share. In 2006 while vacationing in Disney it was Jeff's Birthday so we went to the Magic Kingdom and got him his birthday pin to wear that said "Today is my Birthday". In ToonTown we meet Princess Jasmine, and she instantly spotted his button. LOL! She said to Jeff you are my Aladdin I want you to stand in the middle by me. So now the joke is Jasmine is Jeff's other women. I'm just glad we don't leave closer otherwise I would worry. LOL! This card was a challenge on the Sisterhood of the Blogging Stampers Group and you can find the directions for this card at Craft Weekly TV . For this card the hearts on the front are from Michaels $1 stamp bin. The inside of the card on the tutorial they make another card to place inside but instead I wanted to change it and make this my card. On the inside I stamped a Suzy Zoo and colored in her in and I left the rest of the inside blank because I'm not sure yet what type of card this is going to turn into (a valentine, birthday etc) no sure yet. I am so excited I finally was able to join and complete a challenge at SBS. I made this card last week but couldn't post it until my friend from the Google Message Board recieved it. 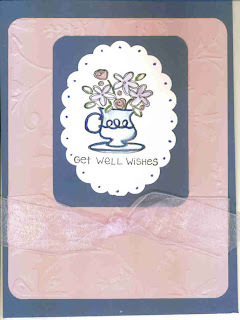 The card sketch was a challenge on splitcoast stampers (click for the link to the challenge). 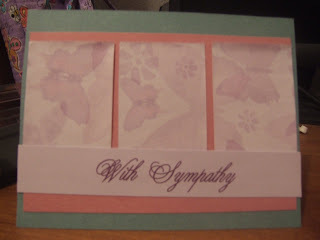 Sympathy cards are so hard to make and they are my least favorite to make of course. No stamps were used on this card just cardstock and pattern paper and the saying was done on my computer. I haven't done much this week craft wise, the only thing I have made was the mailbox. 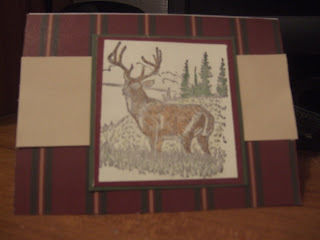 I was working all week on a 6x6 scrapbook page for Jeff's birthday for him but I'm not pleased with the way it turned out after working on it for 3 nights straight, I will not finish it and he will not get it. But any hoot. I have entered 3 blog candy contest in the last several weeks and can you believe I won all 3 of them! Here are 2 of my goodies that I received so far. 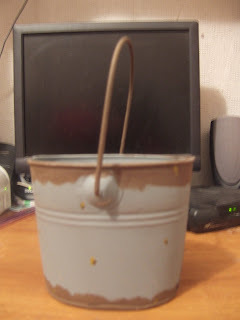 This cute little tin basket I won on Gina K's Blog. I think I'm going to make some flowers with my cricut and maybe make it into a spring type bouquet. There is alot of potential for this little tin. LOL! 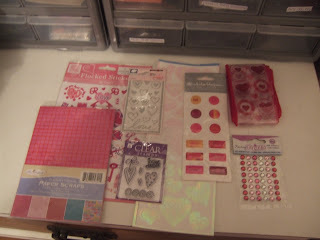 These fabulous valentine goodies I won On Under Krustrion Blog. One night I was going through Ellies favorite blogs on her site came across this blog and entered the contest. The ribbon is soooooooooooo pretty! In the paper packet there is sheets of paper with pink high heel shoes all over it. How cute!!!!!!!!!!!!!!! Great set here! I felt so lucky I entered the Mega Millions Lottory with the girls at work and lets home we win. LOL! I never play the lotto but as the NY lottory commerical says all you need is a $1 and a dream. LOL! First I want to thank everyone for there kind words regarding my back. My back is feeling much better today. Guess my body just wanted a break, I laid on the couch all day yesterday. I had these Target mailboxes for awhile now and I also got one through my cricut birthday club. I put them away figuring one day I will alter them. Saturday I was in Michaels and came across this Tigger paper, I saw it before but never paid any attention to it. Then the light bulb went off, this would be perfect for my mailbox, and the rest is history. 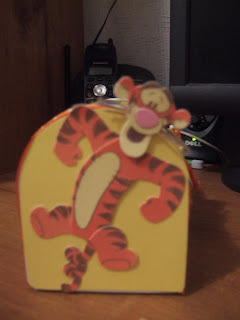 The word Tigger and the actual Tigger on the front of the mailbox are Jolee stickers. 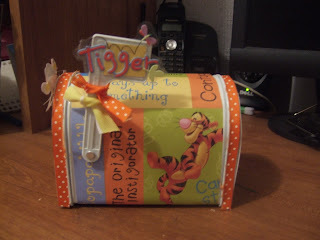 There is an awsome turtorial at Emily's blog for this mailboxes. Its that time of week again, Its Sunday Scrapper Time! Its a great group over there. You post your Ta Da's for the week and your To Do's. This weeks question is Do you sketch your ideas or do you just put things together as you go? When making cards I don't sketch them, very seldomly I do. When scrapbooking on the most part I do sketch out my pages. All of my pictures are saved on CD my theme and I print out a contact sheet (small pictures) of each CD and put it in a folder and then when I sketch out my page I go back to those sheet to find my pictures and when I have the pictures I want I cut them out of the contact sheet and tape them down onto the spot on my sketch. I have found that I can get a lot more done this way instead of wasting time trying to figure out what layout I want or what pictures etc. Seems to be working for me. This Weeks Ta Da: Is my Buddy Loves his Blankie Page that I did. Not only was I able to get a page done but it was also part of a challenge on Split Coast Stampers. And I very seldomly join in any challenges or if I do I join to late and the deadline already passed. I'll keep it light this week because I'm not feeling that well and I pulled something in my back and it kills me to sit for any length of time. So hopefully that will past and I can get more done. On Bella Carta Blog she had a special request to send a Marine whose in Iraq a birthday card. If you insterested in sending him a card go to (direct link to her post) Bella Carta and it will take you to the request and she will forward the mailing address to you.